Sizable rooms, good location. Not directly in front of beach though. But a cost effecitive option. 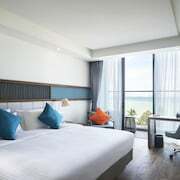 Very nice rooms with a great ocean view. Pool was beautiful and provided pleasant experience. It is just a bit far from the street food. Where to find Nha Trang hotels near an airport? 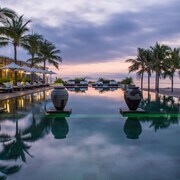 How can I find hotels in different Nha Trang neighborhoods? Where can I find hotels in Nha Trang that are near tourist attractions? 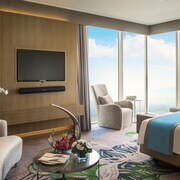 Nha Trang has a quality assortment of comfortable accommodation possibilities to select from. Expedia currently contains 193 accommodation options within a 0.1-kilometre (0.06-mile) radius of the heart of Nha Trang. Location is important when it comes to drama-free vacationing, so be sure to check out the Sheraton Nha Trang Hotel & Spa and Sunrise Nha Trang Beach Hotel & Spa, which you'll find a short distance of Nha Trang's city center. Ninh Van is an area that lies 18 kilometres (11 miles) from the middle of Nha Trang and offers 2 Expedia-listed hotel options. 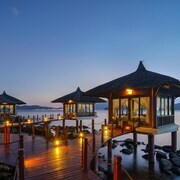 Expedia-listed hotels in Ninh Van are the Six Senses Ninh Van Bay and An Lam Ninh Van Bay Villas. Ninh Hoa is another Nha Trang neighborhood that boasts hotels. An alternative is to check out Cam Lam and Vinh Hai. In Ninh Hoa, the section of hotels include the White Sand Doclet Resort & Spa and Wild Beach Resort & Spa. Alternatively, those who prefer to base themselves in Cam Lam, should check out the Mia Resort Nha Trang and Dessole Sea Lion Nha Trang. Located 3 kilometres (2 miles) from the heart of Nha Trang, Vinh Hai has a number of places to stay including the Fairy Bay Hotel and Memory Nha Trang Hotel. But of course, a trip to Nha Trang wouldn't be complete without a visit to the Vinpearl Land. 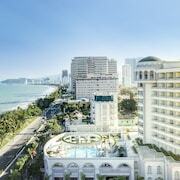 The Vinpearl Luxury Nha Trang and Evason Ana Mandara Nha Trang, are within easy walking distance from Vinpearl Land. Hotels that are nearby to the Long Son Pagoda include the Best Western Premier Havana Nha Trang and the Novotel Nha Trang. The TTC Hotel Premium – Michelia and Nha Trang Lodge Hotel are conveniently located within strolling distance of the Po Nagar Cham Towers. The Dam Market, another Nha Trang attraction, is walking distance from the Galliot Hotel and the Asia Paradise Hotel. Hotels that are close to the Thap Ba Hot Spring Center include the Muong Thanh Grand Nha Trang Hotel as well as the Yasaka Saigon Nha Trang Hotel. Nhatrang Airport is a nearby airport, and can be found 3 kilometres (2 miles) from Nha Trang. 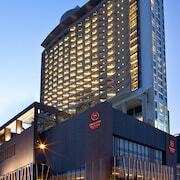 Nearby accommodation options include Nhi Phi Hotel and Lammy Hotel. 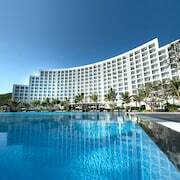 What are the most popular Nha Trang hotels? 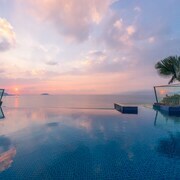 Are there hotels in other cities near Nha Trang? What other types of accommodations are available in Nha Trang? Explore Nha Trang with Expedia.ca’s Travel Guides to find the best flights, cars, holiday packages and more!